Portable fans are a lifestyle necessity in some climates but they can also contribute to the overall décor if they are designed tastefully. 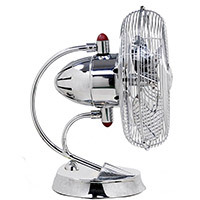 We have created a handpicked selection of portable fans in a wide range of sizes and styles. Easy to move around the home, compact in size, featuring many built-in features for customized cooling & ventilation performance, we bring you the most aesthetically evolved range of portable fans. Yes, we have taken care of ensuring eco-friendly models that are low on power consumption but high on performance. From the globally popular range of Fargo Portable Fans to the mighty performer in Urbanjet and the extraordinarily styled, oil-rubbed portable fan in bronze, we offer the most exhaustive online collection of designer portable fans. You can choose portable fans with blended contemporary & classical styling—robust motors are mated with classically designed fan blades for optimal performance! Portable Fans There are 21 products.